Links for additional support organizations (airport greeters & welcome home signs, Bibles, devotionals & Bible studies, cards & letters, care packages, chaplain resources, coloring pages, humanitarian aid, military working dog & handlers, other deployment support organizations, pet adoption & foster care, prayer support and many other resource) are all listed above. Has pictures posted of the troops as they arrive or depart from Bangor International Airport or Pease International Airport. Go to the links under "Meeting the Troops." Welcome to the oldest and most widely recognized website and picture portal for the troops who have transited through Bangor, Maine. The website www.mainetroopgreeters.com and this picture portal are dedicated to each of these troops and to their family members and friends. Hundreds of our Sailors, Airmen, Soldiers and Marines return from the War on Terror every week through the gates of the Baltimore/ Washington International Thurgood Marshall Airport. 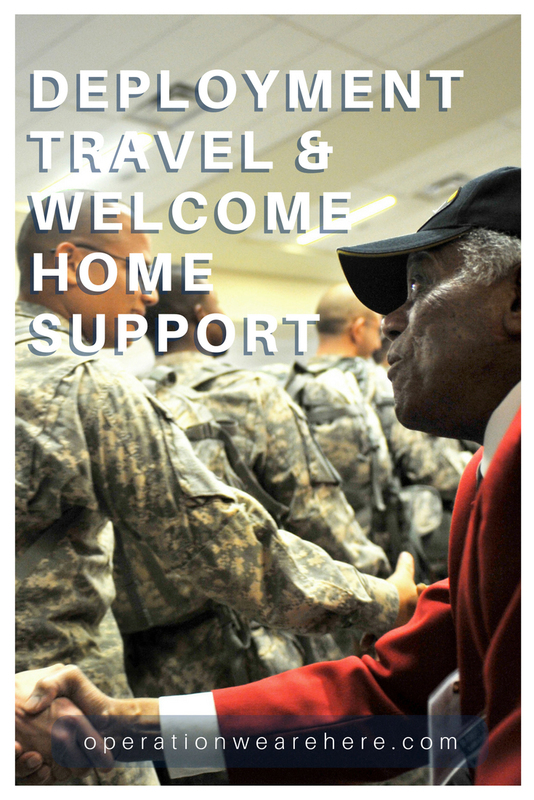 Since March 2007, Operation Welcome Home volunteers have greeted over 700 flights and more than 150,000 Soldiers, Sailors, Airmen and Marines. We invite you to come on out and help us welcome them home! To all our troops and their families. As a measure of our appreciation of your sacrifices we are honored to provide pictures from Bangor International Airport (BIA). Unfortunately, we are not able to meet every flight. We are a “Nana and Gramp” operation limited in what we are able to do. Pictures are posted as soon as possible of being taken. Please note that occasionally a troop will not want their picture taken and we respect those requests. ...the troops arrive to a boisterous welcome. The Greeters are proud of them and give the troops hearty applause, sincere handshakes, and expressions of "welcome home, thanks for a job well done, or we'll be here to greet you upon your safe return." Everyone has a camera to record this happy event. Often the troops want pictures of the greeters. They hug and thank them for being there in the wee hours of the morning or late in the evening. Business cards are exchanged. Friends are made. Soon they move on to enjoy hot coffee, doughnuts, pizza and other refreshments ON AMERICAN SOIL. Initially cell phones were freely offered by the Greeters for the troops to call home with news of their safe arrival. Between June 16, 2004 and March 14, 2012, the Welcome Home A Hero program at DFW Airport had a mission to ensure that every active duty service man and woman returning from the Middle East (primarily from Iraq and Afghanistan) for two weeks of rest and recuperation (R&R) was met at the Airport with cheers and heartfelt emotions, not only from loved ones, but also from the grateful citizens of the North Texas community. Every day, twice a day, for almost eight years, enthusiastic volunteers welcomed home these heroes. A total of more than 5,400 arriving and departing flights with over 920,000 military personnel were greeted with celebrations of love, respect and appreciation for their service to our country. What began as a humble effort to honor our soldiers soon became an overwhelming community expression of support for our troops. This Commemorative Center allows us to share the stories and be reminded that we must never forget. The mission must continue! The mission of A Hero's Welcome is to organize and encourage Americans to welcome home our brave military personnel from the War in a manner befitting a hometown hero. It is through this effort that A Hero's Welcome hopes to promote increased community respect for our service members as well as increased morale for our returning military. Family members who want to accompany a military service member being deployed to the boarding gate or greet them returning from deployment at the arrival gate may receive passes to enter the secure area of the airport. Interested military family members should contact their air carrier representative at the departure/arrival airport for proper local procedures. OWAH's note: It might be wise to make inquires in advance, or arrive early in the event you encounter uninformed airline representatives. The USO provides programs, entertainment and services at more than 180 USO locations worldwide, including Afghanistan, Djibouti, Kuwait, United Arab Emirates, Germany, Italy, Japan, Iraq, South Korea and the United States.